Been working on designing cards and editing videos this morning. Excited to check this one off the list. Now don't forget we are starting a new round of Hostess Clubs next month (November) and I would love to have you join the gang! We meet for 8 months (taking off for December) and each month we stamp three cards. Each member places a minimum of a $20 order and we rotate the Hostess Benefits among the group. It's a great way to get some stamping in and maximize the Hostess benefits. To date, we have reached the 1/2 price item level for every month we've met. Contact me for more information. This can be by mail or in person option to get a little stamping action. Here's the video tutorial for stamping and assembling this adorable little gem. Loved this one as did my stampers! Contact me to reserve you a spot in the next session of clubs. We run it open house style and we usually meet the first Thursday and Friday of the month. 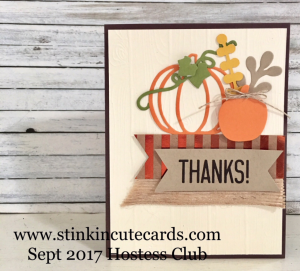 Drop in during the Hostess Club hours and make your cards. It's flexible and fun. What month was the “Thanks” from the Paper Pumpkin kit?